2. Previously I said Sik Sik will do something for Ruco and I saw the preview scene thinking exactly that but that preview scene is actually in this episode and as far as I can see, she is Rachel of Brother’s Keeper, except less annoying and less into hero worshipping even if she has a white knight dream. Seriously TV is also showing Reality Check and I find myself watching that series again which by the way is to me has Ruco at his best except not many remembered that series thanks to the over hyped Brother’s Keeper. RECAP! A short one. In 3 paragraphs. Sik Sik is back to the travel agency to work, in part so that she can look after her really nice brother in law. Back at work she is informed by hated superior, Char Gor (Benz Hui) that her bro in law screwed up a foodie group tour led by acclaimed food critic when he messed up one of the date of the food trip when in actual fact it was messed up by his subordinate. Sik Sik tried to win back the critic’s favour but to no avail. I suppose that will have to wait for the white knight. Meanwhile Ruco is back in HK and his mom, I suppose a food critic also fell down and hurt herself so she was hospitalised. His mother was overwhelmed to see her son came home after 3 years running away from a problem we have yet to be told but we all know is heartbreak. Since he ran away for THREE YEARS I suppose the heartbreak better be a really good one. His mother left his music studio room untouched. Sik Sik by now has lost her patience with Ruco as she left 3 messages on his phone. Worried sick, she wondered what happened to him and phoned Chun Chun constantly to check what the hell happened to Ruco. Her 3rd and last message was almost begging Ruco to return her call, after a customary scolding from her. Ruco had in fact changed his sim card so when he changed back he heard the messages and saw Sik Sik looking for her own phone. Prior to that we had the customary awwwwwwwwwww inducing moment of each of them enjoying coconut drink sitting in the same seat at the same store at different times. Anyway Ruco saw Sik Sik and smiled happily as he greeted the shocked Sik Sik who for one brief moment smiled in relief and as he said “Miss me?” she well.. she kicked his knee and he went owwwwwwwwww and she scolded him for making her worried and that she was worried he died or something and then angrily said she doesn’t want to see his face again and the next time she sees him it will be to pay her respect and give him “white condolence money”. In short she wished him to go to hell. Ruco was shocked but maintained his sorta half smile. I mean can you still smile when someone just wished you death? If that was supposed to be cute I can’t find the humour or cuteness in that. I find Sik Sik’s reaction overblown and Ruco undeserved of those kind of malice spewed by her. This is what I meant by back to square one. There is a difference between angry with someone because you missed them so much and there was no news and how Sik Sik reacted by wishing him death. Very malicious, not cute, not funny and badly written dialogue. So why will Ruco fall for Sik Sik? Because she is his connection to his past heart break? She was apparently in the photo he had in his computer, what is supposed to be the fan meeting with his past love. I feel he had to do so much for her to earn her affection and she did nothing except to spew curses, do violence and become the ogre he manages to bring out of her. Is that the new kind of love? Violence and rudeness is the new form of affection? Does it mean I love Jason Chan very much but just that I don’t know yet? Back in Malaysia Chun Chun wants to win the dessert competition and after seeing a frustrated and heart broken Chin Chun gorging himself with durian that he had stopped eating to win Sik Sik’s heart. Urghhh. Anyway he took her to a durian plantation when she said can she use durian to make local dessert. I was like honey, you’re too late. That idea already done! People have done durian cake, durian cookie, fried durian ice cream, durian pudding, etc. Why it sounded like something new when you can just buy a dessert book, skip to durian section and voila! All durian dessert. Ahhhh I will tell you why. So that they can introduce a durian plantation with an owner who speaks English and cooks amazing assam laksa (by the way the best assam laksa to me is the tiny road side store at the foot of kek lok si temple in Penang (http://en.wikipedia.org/wiki/Kek_Lok_Si) – a must try if they’re still there!) AND a scene of chivalry where Chin Chun hugged Chun Chun to protect her from a falling durian. Mind you, that could have killed him! Sik Sik is secretly glad Ruco is fine again and Chun Chun reminds her about that but Sik Sik thinks well I see him as a friend only. Meanwhile Ruco decides to stay in HK for good. My guess is his dad is Malaysian (Palm plantation owner!) and his mom is from HK. Not important except someone in my blog pointed out that he is palm plantation owner (rich), tour guide (free time) and a music producer (successful) which makes him sorta equivalent to Korean version of chaebol except he may be just half chaebol. Anyway Sik Sik at work and Ruco drops by and she becomes this sarcastic mean ogre until Char Gor appears and welcomes Ruco as the operations manager or something. In other words, add another occupation to his long list of occupations and a very well paid one. Sik Sik couldn’t understand how come he knows Char Gor so well. Me too. He seems to be very friendly with the male managers like Sky Gor and now Char Gor. In fact the famously stingy (in Malay it is KEDEKUT which is pronounced as KER-DER-KOOT) Char Gor actually paid for the lunch welcoming Ruco! So Sik Sik and gang wondered who the hell is Ruco to Char Gor? What’s the connection? I wanna know too because until now I still don’t know the connection between Sky Gor and Ruco except maybe he is a tour guide and the other a hotel manager. Sik Sik confronts Ruco and rudely asks him why he is working in the same agency as her. Well why ah? No other agency issit? Can’t remember his answer except later he overhears her problem with the food critic. My guess is next episode we see the gallant white knight “climbing mountains of knives, descending into a wok of boiling oil” for our undeserving Sik Sik. My comment on the story? Roundabout. Same scenery, same story, same reaction, am losing my patience. Performance wise, is it me only or do you think Ruco has more chemistry with Kristal Tin in No Good Either Way (http://point2e-reviews.blogspot.com/2012/07/no-good-either-way-otvb.html) in the following single picture than Aimee and Ruco in the entire series up to episode 11? Even if there were scenes of Ruco looking at their Chew Jetty pictures? I never saw it before, but I see it now. Ruco’s pretty good looking. Anyway, I agree, it does feel like one step forward and then two steps backwards a bit with these two. However, to be fair to Sik Sik’s character, Mr. Luk is not exactly a catch…not yet. Sik Sik make kick him in the shin a lot, but Mr. Luk is also a bit annoying with his behaviour. I still couldn’t tell whether he’s being nice to Sik Sik because he’s being nice, or if it’s because he likes her. He sends a lot of mixed messages and he’s not honest (in that it feels like he’s trying to be someone else too much) so I think Sik Sik is in the right not to trust him, at least not yet. “the next time she sees him it will be to pay her respect and give him “white condolence money”…. er no, what she said was “i was afraid something had happened to you and i have to give condolence money”. Sik Sik obviously has anger management issues and is unable to articulate her concern for Luk Kung Zi in a civilised manner. Call it pride maybe cos he sort of teased her “so you’ve been looking for me so many times”, that was when her demeanor changed. Ahhh, looks like it’s back to square one in their relationship just when we all thought they were getting somewhere! As a side note, yes Ruco does look very handsome in this drama, especially in those tank tops showing off his well toned physique; he’s eye candy which no doubt is the reason many of us are following this drama. Similar meaning, either way incredibly rude. no it’s not similar. She did not wish him dead, she said she tot he was dead. rude yes, very very rude indeed. She wished him dead. MY cantonese isn’t that bad. no la…you go and watch again. Actually I think it is meant to be like you know, you like someone but doesn’t want to admit it and so disguise that liking/concern with frustration and anger. yes agree, i know what you mean. Typical TVB style. While Funn became inpatient, I started to accept this drama. Started to accept Aimee’s performance, like the theme song and accepted LXW singing method, accepted the long drag plot and etc…. I’ve done all of that all for the sake of Ruco! Too expensive. And still got tickets? hi funn, want to go together? Not interested because I feel ticket is overpriced. And the cheapest one you can’t see much even if I suppose the arena is not that big. Were you at the AStro awards? i only attended an Astro event once in 2011, which was an invitation sent to certain astro subscriber houses around KL … suppose to be reward for loyal customers i suppose =P, they even treated guest with wonderful western dishes buffet with fish and clams … i actually went alone because none of my friends wanted to go, i should have got to know you earlier then i could have given you the extra invitation pass. Wahhhh so close!! You could have hugged him! @anneyen, you’re so lucky to get up so close! You played the game with him or Kenneth? Any individual pic? What did you win? but at that moment i actually felt kenneth’s eye stare was more electrifying … when kenneth appeared on stage to sing i waved at him and he waved back and stare at my direction for about 2 minutes, but i was too nervous and stunned that i suddenly stop waving …oh my gosh! thinking back i should have continue waving to give him support … after that i was too shy when playing the game that i didnt even dare stare at him on stage … sometimes at that moment he really looks like the scary villains that he portray in dramas … however at that event it seems like kenneth is more funny and hillarious when playing games, ruco was more like the serious type but he is really very fast thinking. all other public events in that schedule to malaysia was michael tse and ruco, this was the only rsvp invitation event with kenneth and ruco combination, guess thats the benefit of being a long-term Astro =) … ruco wasnt very popular yet at that time, so not many people know him … the drama that he was promoting at that time was “The Other Truth” but i have not watch the drama at that time, i only remember him appearing in the ATV drama “Love in A Miracle” where Ruco did play quite a major role, handsome too =) … so of course i had to do some homework and rivision in google and youtube about “The Other Truth” just in case their is some question and answer game =P … unfortunately, the invitation card was under my friend’s father name and her family did not allow her to go so that means im not getting a chance to go =( … fortunately my aunty staying in another area also recieve the invitation card, so yippee i reserved 2 place =) … but my friends were not interested or didnt turn up last minurte so i went alone … i dont have astro so i had to use my aunt’s account … eventually a few friends i met there also actually used their aunt’s account, including the girl in pink next to me =P … it was a pool side party with 4 hour buffet eating session before kenneth and ruco appeared, meanwhile there were local stars to entertain … there were only around 40 guests at the event, not that many maybe because the invitation card was targeted at parents who own the tv account whom may have not allowed their children to attend, furthermore it is at a bar =P … but this is GREAT, more chance to get up-close =D … about 30% youngster and 20% elderly audience, mainly english speaking chinese because of the area where the invitations are sent. i was shivering all the way but forced myself to recompose at the stairs to the stage … oh, right before me wa ruco standing right in front of my eyes … straight away he offered a handshake and said “do jeh (thank you)” and nodded … then after that the girl in pink was behind me, once all three of us his participant was on stage he nodded again, felt like was he counting how many of us lol =P … actually i really didnt feel shaky anymore after shaking hands with him. it was a “POSING GAME”, all of us together with kenneth and ruco had to do about 10 different poses that the emcee mention … i did some funny thing on the first pose, oh my god so embarassing, sorry Sam Sir ^ ^ … the first post was to post as a police, i dont know what the hell went wrong with me that i folded my right hand on to my left hand elbow with my left hand stretched out like a pistol … so the emcee asked me, “cheng man jeuk bak sik hak sik sin sam yi wai siu jeh jo gan ge hai mad ye POSE? (may i ask this girl in black and white stripe what POSE are you doing)” … everyone on stage was actually looking to the front, even ruco was looking to the front then he suddenly realize something wrong … so he looked at me then helped me patch up things, he told the emcee “hui hai (she is Black Rose – Lui Sat Sau)” =P .. then after that there was a few more other post like yoga, everything went on smoothly then one was “wong fei hung” … this time the uncle in yellow shirt next to me did something funny and was questioned by the emcee again … seems like ruco’s group became a joke while everything went on smoothly in kenneth’s group =P … and then the emcee read out another pose again, this time “Charlie’s Angle’ … kenneth’s group quickly move into position … while ruco was busy asking us “dim yong zhou (how to do? )” a few times, i suppose he doesn’t know Charlie’s Angel i guess … so i quickly ran over to his right side and put a pistol pose, this time i did it right =) … and this was the time i could even get closer next to ruco and 2 feet away from kenneth for 2 minutes ^ ^ … but again it turn into a joke, kenneth laughed at ruco “dim gai yao nam yan ge? ( why is there a man? )” … ruco looked puzzled and just laughed … after that i went back to the previous position (as in the photo) and a few more pose … next, it was suppose to be the ‘CHOK’ post … kenneth straight away told ruco, “gang hai ngo chok go lei la (of course i am more chok then you)” … so both of them went out to the glass bridge and around the stage to do a ‘CHOK yeung’ walk … meanwhile we the participants on stage was keeping the ‘CHOK’ post, the girl in pink next to me is english speaking so she was asking me what to do for this pose when i myself was also a little blank. @anneyen, wow you can still recall the details so vividly. Did you write it down in your journal or something? Lucky you to get so close to Ruco! If i were you, I’ll probably pass out the moment he shakes my hand! You shld go to the Genting concert, it’s once in a lifetime! I am with Funn. I can’t follow the logic of the development of the characters anymore. Sik Sik’s reaction to Luk not returning her call was way over the top!! So what if he doesn’t call back. He doesn’t have to. If I were Luk, I would run away from that girl. She is not even a girlfriend yet and she reacted like that, imagine what it would be like when she is a girlfriend. You don’t return her call, she may really harm you!! The impression I got from watching TVB series is that HK girls are generally spoilt and unreasonable and HK guys are generally wimps and doormats who like being tortured by their girlfriends. Hopefully, that’s just in dramas for their entertainment value and it’s not true in real life. 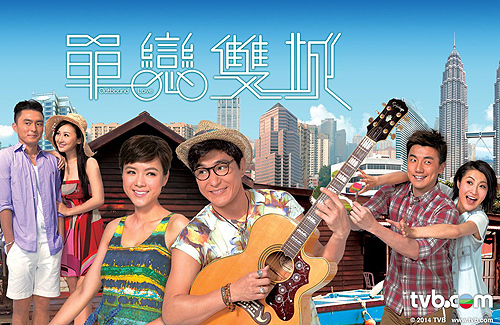 I think TVB doesn’t lack good artistes, it lacks good script writers.